Has it already been a dozen years, more than 4,000 days, if you prefer, since daily life changed forever for our nation’s travelers? Every trip to the airport, every eyeball-to-eyeball encounter with a uniformed Transportation Security Administration officer confirms it. Time really flies! So do Americans. Well over 700 million of us take to the air each year in the U.S., a figure the FAA estimates will soar to 1.3 billion by 2031. Assuming that most bring at least something on board with them, that’s quite a lot to eyeball. What were they looking for, and what did they find? Not long after the horrible events of 9/11, I started calling around for TSA-confiscated goods. It took three-dozen phone calls and countless emails but the effort paid off when a government agency offered to sell me original contraband from six California airports by the pound. I offered $1 a pound and soon had a deal. Months later, the agency added two more airports to its collection route. Feeling I wasn’t finished and probably wouldn’t get the chance again, I purchased another ton. The first pieces in the Banned Booty series incorporate run-of-the-mill booty from the initial haul, such as scissors, Swiss Army knives, and nail files. The more unusual paraphernalia made me wonder: “What were the Feds thinking when they declared these items as weapons?” A toy shot gun? A cheese knife and spreader? A Chinese frying pan? Deer antlers? Were they kidding? 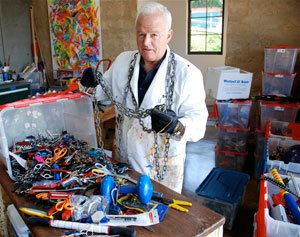 Equally intriguing: Why were passengers trying to carry these things onto a plane in the first place? With no information available, I began creating personalities with my art. 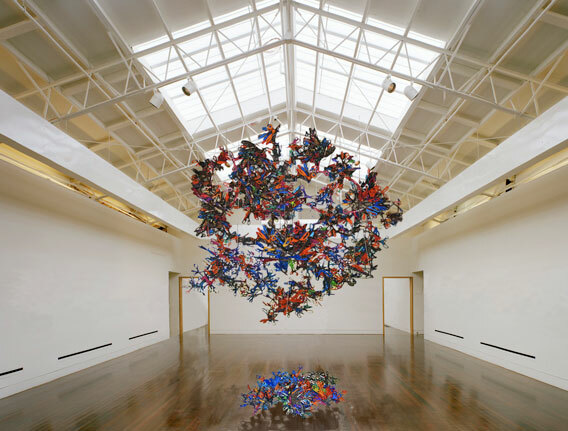 Armed with 21st–century passenger booty, I shaped artistic interpretations of our time. 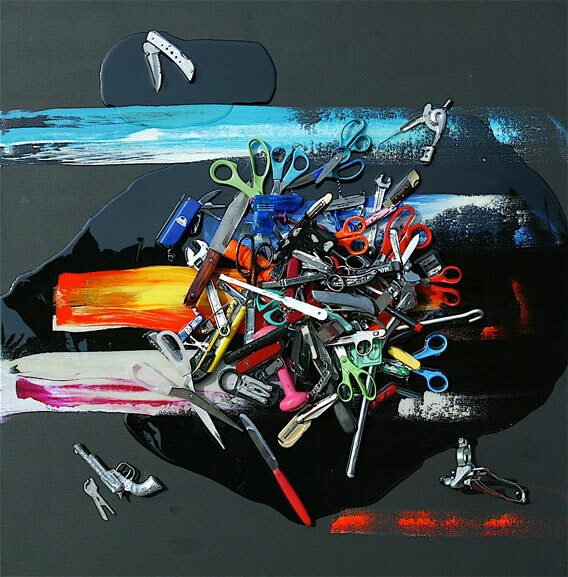 More than two-dozen professional scissors compose A Cut Above. Needle-nosed pliers and a physician’s reflex hammer must have belonged to Seasoned Travelers. And Houdini Booty Lock Up, my interpretation of a contemporary time capsule, cuts across every demographic line. It is also, I believe, a necessity for our time, even as we kvetch over the resulting inconveniences. As 9/11 slips further into the past, we must never forget how fortunate we are to enjoy the freedoms our country offers, which include expressing our personal feelings on TSA agents rifling through our carry-on bags as I have with the Banned Booty series. 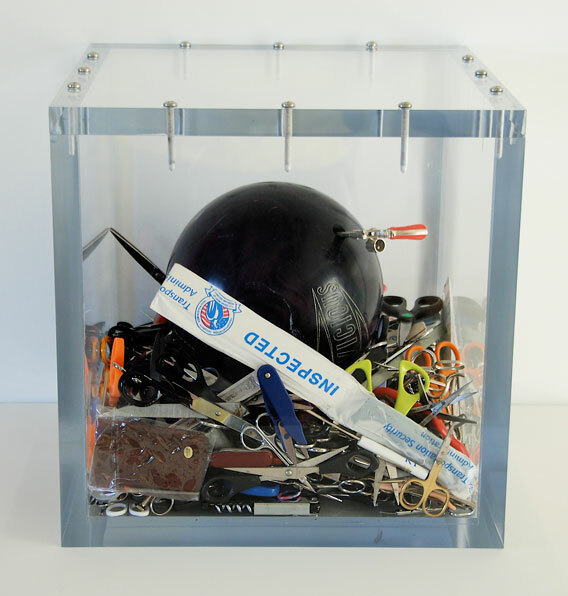 Booty Bowler, 2009, Items confiscated by airport security from passenger carry-on luggage in acrylic box, 16h x 16w x 16d inches. Big Banned Booty, 2002, Items confiscated by airport security from passenger carry-on luggage, resin, acrylic, pastel on board backed canvas, 42h x 64w inches. 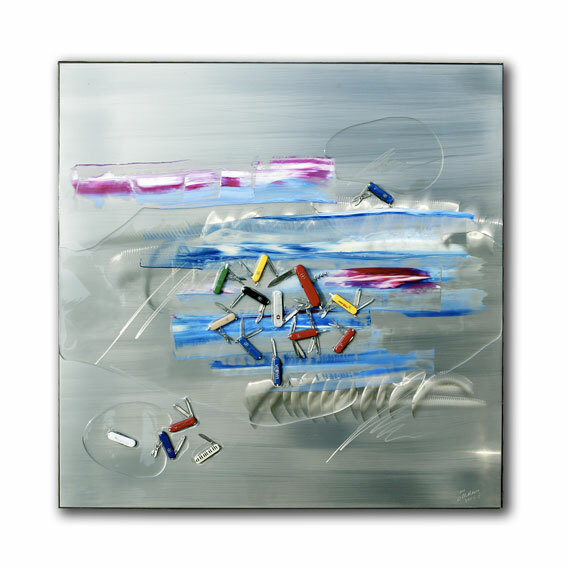 A Traveler’s Pile Up, 2003, Items confiscated by airport security from passenger carry-on luggage, oil and resin on board backed canvas, 36h x 36w inches. This image was used as the cover of the artist book on the series, titled Banned Booty. 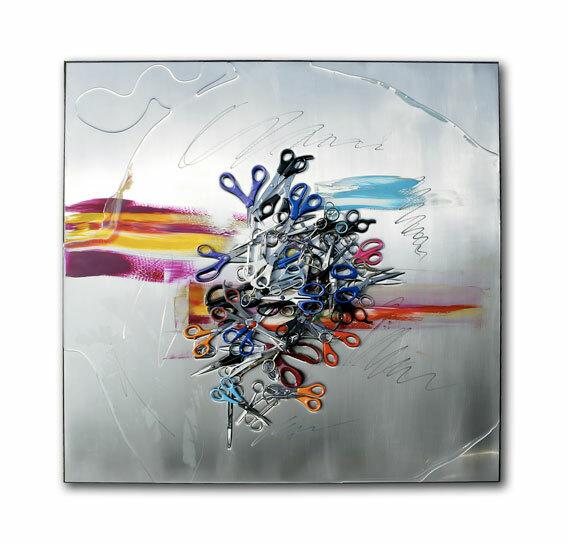 A Cut Above, 2003, Items confiscated by airport security from passenger carry-on luggage, oil, resin and stainless steel on board backed canvas, 36h x 36w inches. 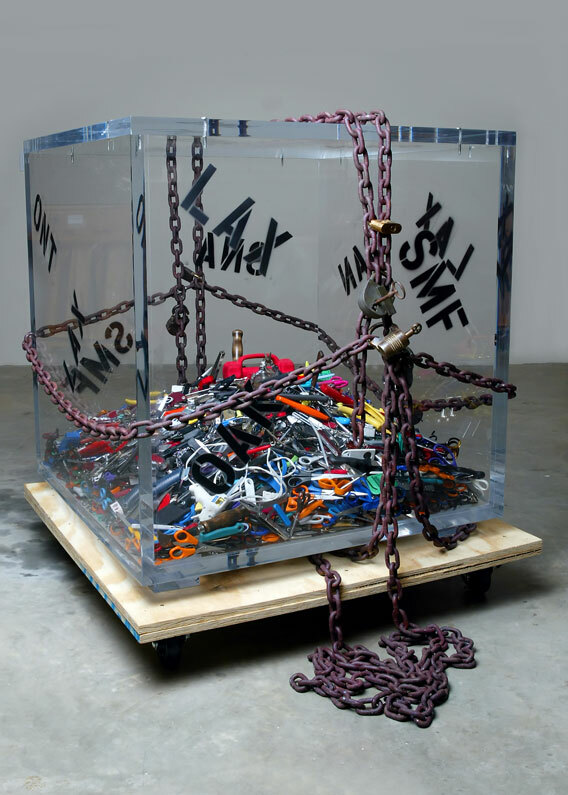 Shear Madness, 2011, Scissors confiscated by airport security from passenger carry-on luggage suspended on stainless steel aircraft cable, 72h x 86w x 72d inches. 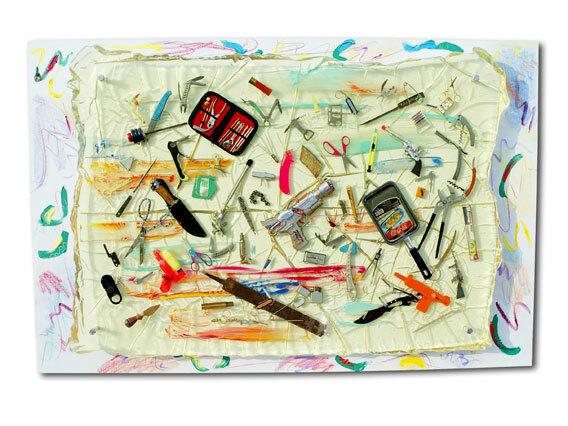 Swiss Travelers, 2003, Items confiscated by airport security from passenger carry-on luggage, oil, resin and stainless steel on board backed canvas, 36h x 36w inches. 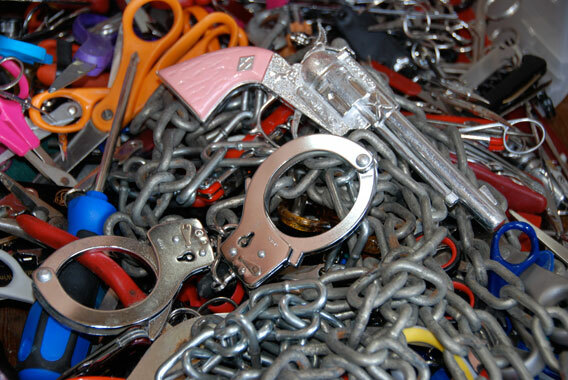 Random image of un-sorted items confiscated by airport security from passenger carry-on luggage from 8 California airports. 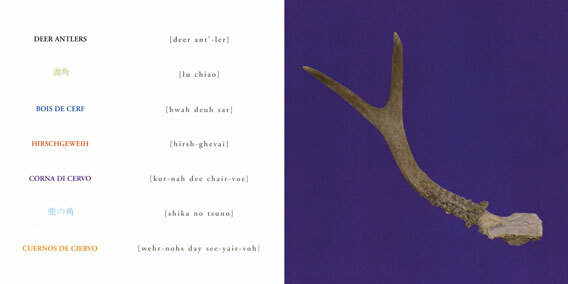 Deer Antlers in English and translations in 6 other languages. One of the more unusual items segregated by the artist from his two tons of stash, to be photographed and included in his book on the series, titled Banned Booty. 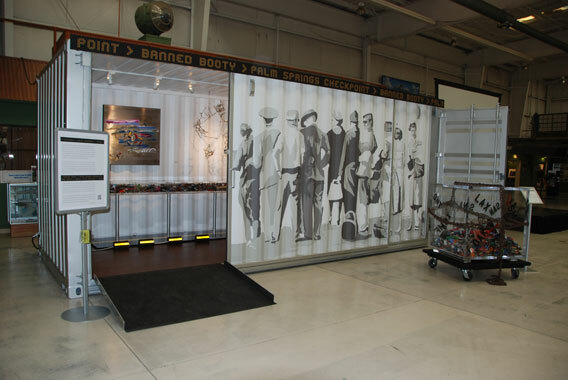 Exterior view of his traveling exhibition Banned Booty-Palm Springs Checkpoint, currently at The Palm Springs Air Museum in California thru May, 2013. 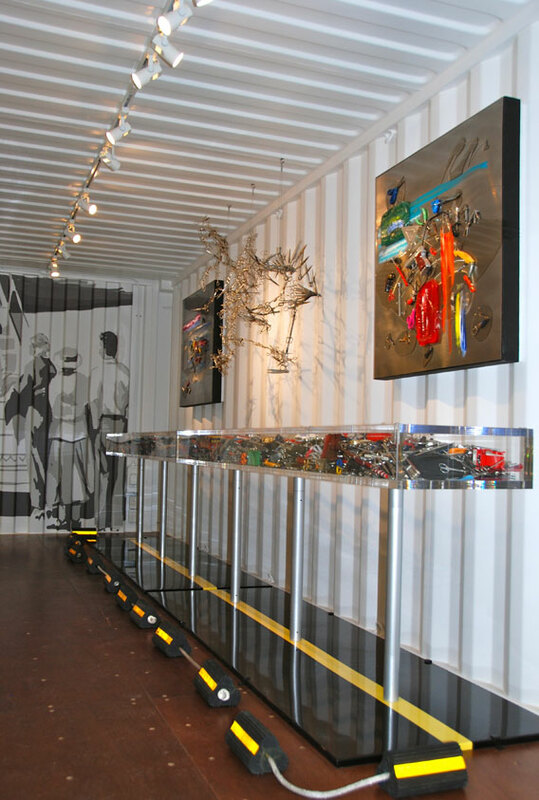 Booty Runway, 2011, Items confiscated by airport security from passenger carry-on luggage in acrylic superimposed over painted metal runway, aircraft rubber chocks, 36h x 192w x 18d inches. 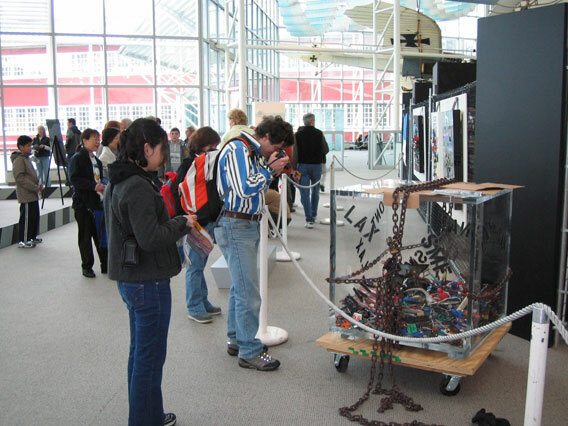 Houdini Booty Lock-Up, 2002, Items confiscated by airport security from passenger carry-on luggage in acrylic case, rusted chains, and antique padlocks, 36h x 36w x 36d inches.